It seems that lately the Japanese automaker Mitsubishi has become somewhat of an afterthought in the marketplace, and its 2016 Lancer 5-passenger compact sedan may partly indicate why. Though competent and fuel efficient, this commuter just isn’t as refined, nimble, or eye-catching as rivals like the Mazda Mazda 3, Honda Civic, Ford Focus, or Kia Forte. All that being as it may, however, the 2016 Lancer is still an inexpensive family 4-door that offers its share of efficient power and performance, with enough creature comforts to keep the trip to the office or mall more than just bearable. For 2016, the Lancer lineup has added a new trim and deleted an old one. The SEL joins the family as an upper-midlevel edition, slotted between the lower-midlevel SE and the sport-oriented GT, while the Lancer ES returns as the base trim. The sales-challenged Lancer Railliart, however, bites the dust for the upcoming model year, and the turbo-powered and performance-driven Lancer Evolution is reviewed separately. Further upgrades for the 2016 lineup include a new front fascia, a redesigned center console, upgraded seat fabrics, and 2 new color choices, Diamond White Pearl and Alloy Silver. The base ES trim now offers all-wheel drive (AWD) and the SE and up can now be equipped with Mitsubishi’s Fuse Hands-Free Link System, integrated with Bluetooth technology for enhanced voice-activated multimedia functions such as music streaming. Both the SE and the new SEL trims again come with standard AWD, while the ES returns with standard front-wheel drive (FWD) and the above-noted AWD option. The GT is offered solely with FWD. Appearance-wise, look for the 2016 Lancer ES to roll on 16-inch steel wheels, with the SE and SEL boasting 16-inch alloy wheels and the GT sporting 18-inch alloy wheels. The GT also features a standard rear spoiler, power sunroof, and sport-tuned suspension. Inside, the 2016 Lancer ES comes with newly enhanced cloth upholstery, full power accessories, cruise control, and a tilt-only steering wheel. Also featured are such niceties as climate control, Bluetooth hands-free calling, and a 140-watt audio system with 4 speakers and a USB port. The SE adds standard heated front seats, a rear-view camera, satellite radio, and 6 speakers, while the debuting SEL boasts leather upholstery, an auto-dimming rear-view mirror, and upgraded interior accents. The performance-oriented GT features upgraded climate control and Rockford Fosgate premium audio with 750 watts and 9 Surround Sound speakers. Options across the Lancer lineup include remote engine start, LED interior lighting, and upgraded interior accent materials. Higher trims also offer GPS navigation. Trunk space in the 2016 Lancer is a mediocre 12.3 cubic feet, but reviewers are quick to point out that this compact sedan comes with some surprisingly generous rear-seat leg- and headroom. Powering the 2016 Lancer ES is a 148-hp 2.0-liter inline 4-cylinder (I4) engine that mates with a standard 5-speed manual transmission to put out 145 lb-ft of torque. This base trim can also be fitted with an available continuously variable transmission (CVT) that Mitsubishi claims offers smoother shifts and better fuel efficiency than the current year’s version. With standard FWD and the 5-speed stick shift, this base powertrain is estimated at 24 mpg city/34 highway/28 combined, while the FWD variant with the upgraded CVT is estimated at 27/35/30. EPA-estimated fuel economy numbers for the I4 with AWD and the CVT are not yet available. All trims other than the ES sport a standard 2.4-liter I4 that’s good for 168 hp and 167 lb-ft of torque. Look for the CVT to come standard aboard the SE and SEL, while the GT features the 5-speed stick shift with the CVT optional (and offered with an auto-manual mode and steering-wheel-mounted paddle shifters). Mileage figures in the CVT-equipped FWD GT are estimated at 24/31/27, 22/31/25 with the manual transmission. 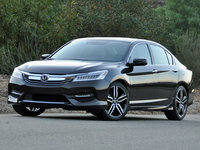 The SE and SEL equipped only with the CVT and AWD are estimated at 22/29/25. The base ES trim also gets the improved I4 when delivered with optional AWD, but this combination has to include the CVT. Standard safety features aboard all 2016 Lancer variations include 4-wheel antilock brakes (ABS), with the FWD ES equipped with a front disc and rear drum setup, while all other trims boast front and rear disc brakes. Further standard safety equipment for all 2016 trims includes traction and stability control, front side-mounted airbags, front and rear head curtain airbags, new LED daytime running lights, front fog/driving lights, turn-signal-integrated mirrors, and a remote antitheft alarm. All trims also remain eligible for available rear parking sensors. The 2015 Lancer received 4 out of 5 stars for crashworthiness from the National Highway Transportation Safety Administration (NHTSA), while the Insurance Institute for Highway Safety (IIHS) gives the current Lancer its best score of Good in all tests except the small-overlap frontal offset, where this family 4-door was rated a second-best Acceptable. 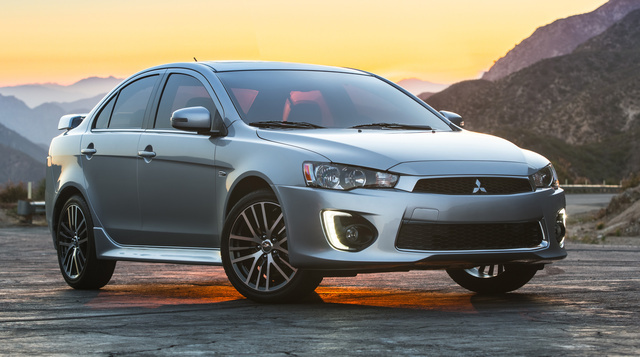 What's your take on the 2016 Mitsubishi Lancer? Users ranked 2016 Mitsubishi Lancer against other cars which they drove/owned. Each ranking was based on 9 categories. Here is the summary of top rankings. Have you driven a 2016 Mitsubishi Lancer? Except for the LED lights around the driving lights, will a 2015 lancer front bumper cover fit on a 2016 lancer ? My started winening and sounding like it has an exhaust leak under the hood what could it be? Has anyone put 235 tires on their stock Lancer GTS? Will it run?